Industrial round knife cloth cutting machine made in USA. Eastman Cardinal 567 Super-Duty round knife cloth cutting machine. 7.5" blade version. Eastman's super-duty cardinal is its most powerful round knife model with a 1.25 horsepower motor. 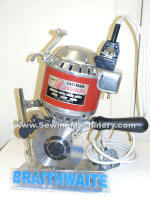 Small hand held round knife fabric cutting machine. Serviced, tested with new 7 sided blade fitted. Used for cutting/making rags, disposable wipes and towels etc. Serviced with new blade, stones and supplied 3 months industrial warranty.